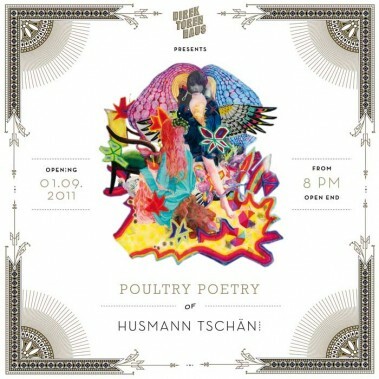 Direktorenhaus presents ‘Poultry Poetry’, an exhibition of Husmann/Tschäni From 1st September to 31st March. By the exhibition “Poultry Poetry“, the artists are inviting the visitors to a trancelike “Séance”, a concurs of feathers and colors. The show at Direktorenhaus consists of both exquisite illustration works, in which they make use of their paintings and “left overs” of performances, like costumes and fabric sculptures. Both are displayed together to create an environment that is at the same time powerfully dominated by illustration and theatrical presence.